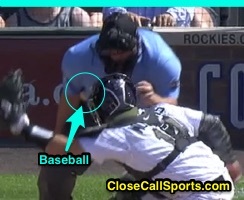 When plate umpire Dan Bellino caught a pitch in his right bicep in Colorado over the weekend, he called "Time" and awarded Reds runners an extra base, the makeshift arm/elbow/oblique "umpire's mitt" at home plate appearing to cause confusion as Rockies Manager Bud Black came out to ask why his opponent's baserunners were being advanced on a ball that never left the home plate area. Bellino catches a 91-mph pitch & awards bases. The Play: With none out and two on (R1, R2) in the top of the 8th inning of the Reds-Rockies game, Reds batter Joey Votto took a 1-2 fastball from Rockies pitcher Mike Dunn that eluded his catcher and nestled in the natural glove between Bellino's right arm and body, where it remained as Bellino immobilized his arm, called "Time" & carefully removed the slightly-stuck baseball. Case Play Question: Amongst the several theories posited by the various broadcasters were balk, no pitch, and doesn't make sense because the umpire is part of the field of play. Indeed, both clubs' broadcasts treated the event as "no pitch" and kept the count at 1-2...even though the runners advanced ("I'm wondering why they automatically get to advance the base...isn't the umpire part of the field of play?"). Is this a lodged ball pursuant to the terms of Official Baseball Rule 5.06(c)(7) [see rules library, below], and is this a "no pitch" as the broadcasters surmised (what was Bellino signaling)? Why or why not, and what should the proper call be? Answer: Because the ball wedged between the umpire's arm and body, and remained there, this can be considered a lodge in the umpire's paraphernalia. 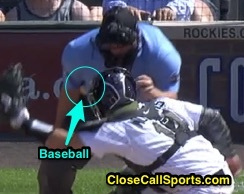 In general, a lodged ball is a ball that has both become stuck (in this case, in the umpire's paraphernalia), remains stuck, and is inaccessible to the defense. A ball trapped in the umpire meets all criteria and, thus, is to be deemed lodged. Compare and contrast this play with last season's first Case Play, when a dropped third strike produced a pitched ball that stuck to the front of catcher Yadier Molina's chest protector, but remained readily accessible to the fielder throughout the play. Related Post: Case Play 2017-1 - A Baseball Made of Velcro [Solved] (4/10/17). This play from 2017 was not a lodged ball. Had Bellino immediately opened his arm and released the ball from his person, it would not be lodged, since it would not meet the "remains out of play" criterion. With a lodged ball, the proper call is "ball two," dead ball, and runners advance one base from time-of-pitch (or return if the lodge occurred on a foul ball, or if the runners had advanced more than one base from TOP when the ball became lodged). The ruling is the same at all levels, but is different than handling a live ball, which would occur if the umpire voluntarily reaches for a live ball. In NCAA/OBR, the ball would remain live, while in NFHS, the ball would become dead. Finally, Bellino's signal to both dugouts concerned the pitcher and indicated that the Rockies were not charged with a mound visit. 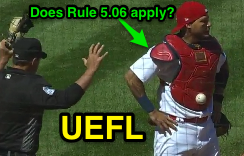 OBR 5.06(c)(7): "The ball becomes dead and runners advance one base, or return to their bases, without liability to be put out, when—A pitched ball lodges in the umpire’s or catcher’s mask or paraphernalia, and remains out of play, runners advance one base."